Griffith farmer Garry McMaster has always wanted the biggest Case IH tractor he could get and now that he has a Steiger 535, he’s discovered that size and power don’t have to come at the cost of increased fuel consumption. Garry runs an 8,000-hectare operation across three properties at Hillston, 100 km west of Griffith in New South Wales with his wife, Christine. 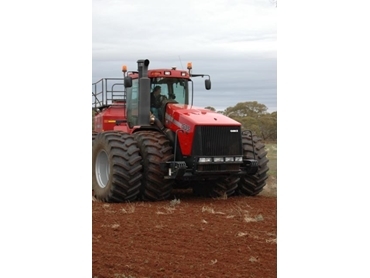 He was the first farmer in NSW to buy a 535, which he purchased through Case IH dealer Hartwigs at Griffith. He chose the 535, which arrived in March this year, because it would pull his 17m international air seeder and 2230 cultivator bar with ease, but he soon learned that it also offered great fuel efficiency. “I always said that I wanted to get the biggest Case IH tractor ever made and the 535 has proven itself in terms of value for money, cost and efficiency,” Garry said. This season, Garry has sown 3,292 hectares of wheat and 308 hectares of barley using his Steiger 535. He also runs 120 head of beef cattle and his fleet also includes a Magnum 7230 and a MXM 190. The 535’s ability to get power to the ground is thanks to its Tri-Point oscillation system, which uses a linkage system to transfer draft loads created by the implement to force the front wheels to the ground and gain more traction. “Given that it’s so hard to find staff these days, being able to get the job done myself in a shorter window and with less fuel, is quite a benefit for our farming operation,” Garry said. The 535 is also approved for biofuel blends of up to 20 per cent.